This is awarded the Minister of Agriculture, Forestry and Fisheries prize in 1997. This is a concession of Akita Konno. We had continuously studied Koji for improvement, with the result that we succeeded in development of white fungi and got a concession (no.274973, no.274974). These white Koji fungi which are pioneer of Koji producing industry have the same enzymatic activity with that of progenitor fungi and these are clearly Asp. oryzae in mycology. Method of producing Koji is the same as traditional one. Completed Koji always keeps its white. Please, use this excellent Tane-Koji made by Akita Konno which has been favorably reviewed since sale. Long hypha. Progress of article temperature is slow rise in the beginning of Koji incubation period. Having strong saccharification. Its tightness is lax. Medium hypha. 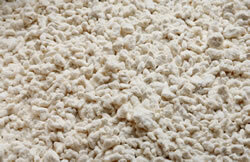 Scent of Koji is good and this forms pure white Koji. Well tightness is strong and looks good. This is good for sale Koji and Uki-Koji which is used for Uki-Koji Miso made around Niigata prefecture. Non-dark and non-black pigment. Medium-short hypha. Sharp growth in the beginning of Koji incubation period, good penetrated and strong saccharification. Best for Miso and for processing. Medium hypha. Good penetrated and saccharifing type. Normal progress of article temperature. This is widly used for Amazake, Miso and processing. Medium hypha. Strong protease activity. Best for Miso. Progress of article temperature is sharp rise in the beginning of Koji incubation period. Easy to use. Medium-short hypha. Good for mechanical production of Koji. Good penetrated. This becomes break type of Koji.